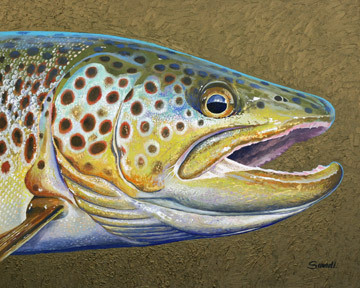 Silver Creek Brown presents a dramatically painted brown trout head in full spawning colors, vibrating with delightful colors and sparkles. This particular fish has double halos around the spots, markings of extra interest. 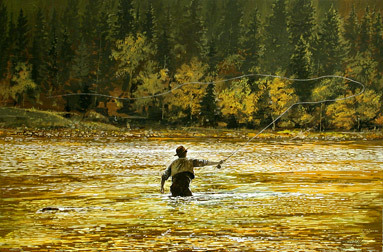 The sky glistens blue on the wet surface of the fish, adding its own magic to the painting. This painting is 40″ wide by 30″ high created with acrylic paint on canvas with painted gallery wrap edges so framing is optional. This distincticve painting has been sold. 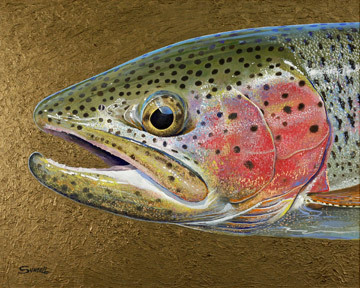 Wild Rainbow is a celebration of all the sparkling colors seen on a spectacular rainbow trout. 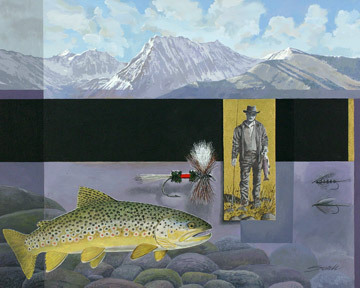 The head of the fish itself is the subject of this exploration of color in all its myriad facets. This painting simply must be viewed in person to fully appreciate its qualities. Bern studies his fish closely when he catches them, taking note of every spot, speckle, and variation of patterns before he releases them. 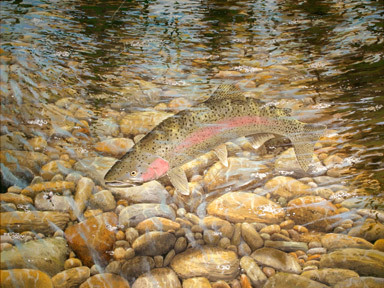 His paintings reflect this intense absorption in the details of trout. This painting is 30″ wide by 24″ high created with acrylic paint on canvas and beautifully framed. This distinctive painting sold immediately.